독립된 스테잇룸이 4개에다 커다란 사롱이 사진으로 확인된다..
일반적인 토너먼트용 피싱요트와는 달리 캐빈으로 폐쇄되었다..
다시 말해.. 대양항해용 스포츠 피쉬라는 것이다..
스포츠 피쉬는 우선 가격이 월등하게 차이가 난다..
함께 감상하던 한 요티언은 그랬다..
요트의 크기는 선장의 능력이 아니라 재산관리의 능력이라고..
60피트 이상의 크기가 되면 호화 요트가 분명하지만..
우리도 그들을 향해 있는 요티들이니까... 라고..
LOA: 76' Beam: 21' Draft: 5'11"
The "Boomer" is 4 stateroom, 5 head, galley up, with cockpit mezzanine and dry head outside. 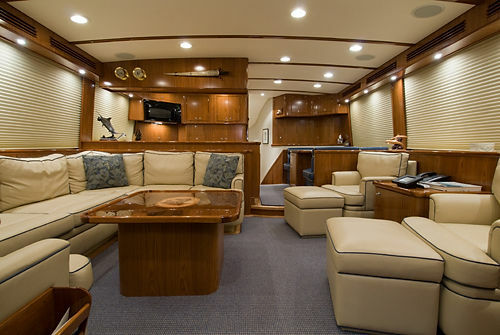 As you walk into the salon there is a wrap around sofa to port with storage and a beautiful custom high/low table in the center. 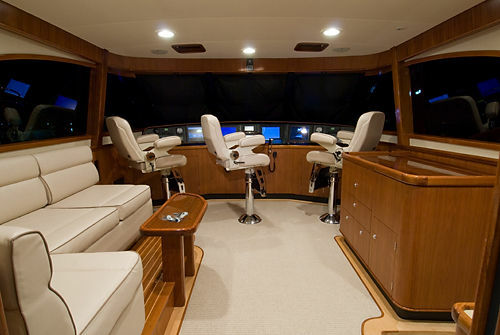 There are two chairs to starboard with 42" plasma TV in cabinet that raises for great viewing. 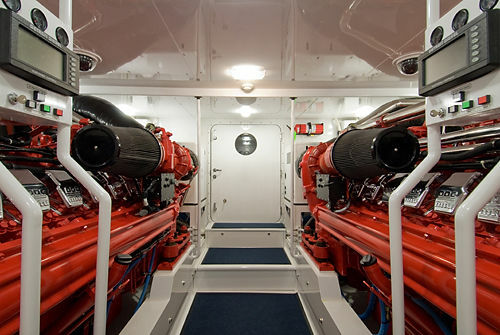 The electric panel is starboard for easy access and viewing. 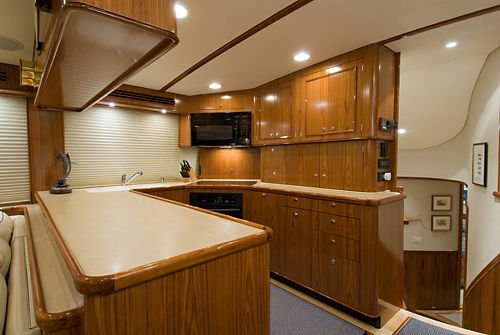 The roomy galley is outfitted with the best appliances, making the cooking experience enjoyable. 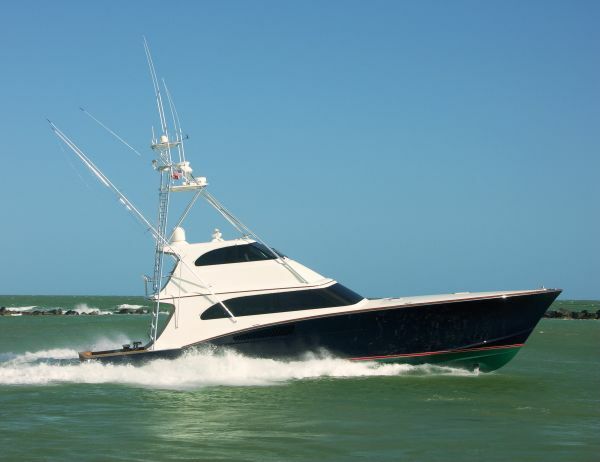 The galley also features a bar and table for four starboard, Meile dishwasher, 2 custom refrigerators, Corian countertops, full oven and cook top, GE microwave, coffee center, ice machine, and double sink. 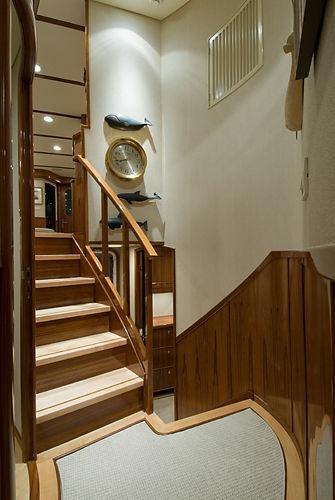 The companionway is down a set of stairs and is curved to give it a great feel and provides privacy to the master stateroom. 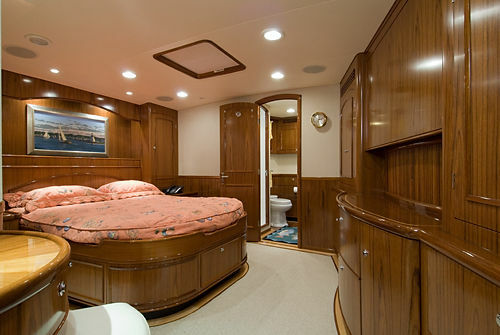 The master stateroom is forward with rich mahogany and teak wood. 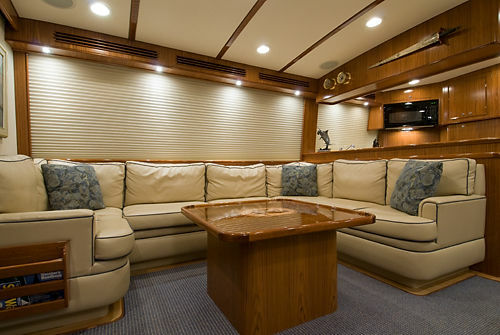 It is a beautiful stateroom with plenty of storage space for all of your belongings. Plus a 32" LCD TV, DVD, AM/FM/CD with surround sound. All drawers and closets are cedar lined. 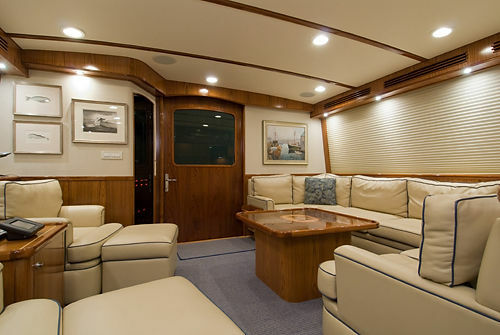 Carpet is inset with maple and teak border. The master head is forward with Corian countertops and sink; lots of storage and teak and maple sole with larger shower to port with seat. Vacuflush freshwater heads with blower system and built-in laundry hamper. 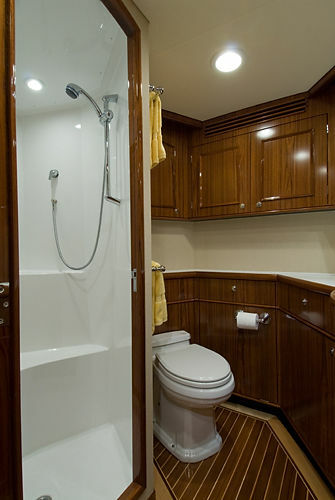 Port VIP stateroom, the guest cabin features a queen sized bed, cedar lined hanging locker, drawer with storage under bed. The entertainment center has an 18" LCD TV, DVD, AM/FM/CD player. 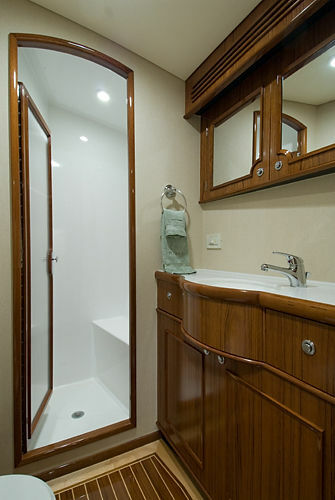 The head has Corian counter tops, sink, large shower with seat, and Vacuflush head with laundry bin. 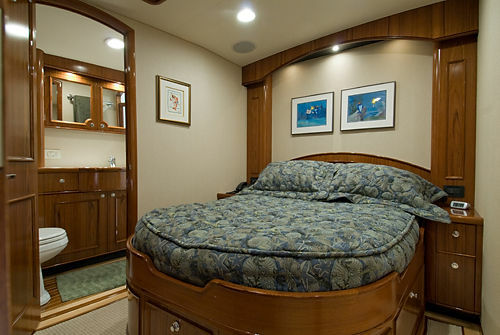 The starboard guest stateroom also features a queen sized, walk-around berth, cedar lined hanging locker, drawer under bed, entertainment center with 18" LCD TV, DVD, AM/FM/CD. The head has Vacuflush head and Corian counter tops. 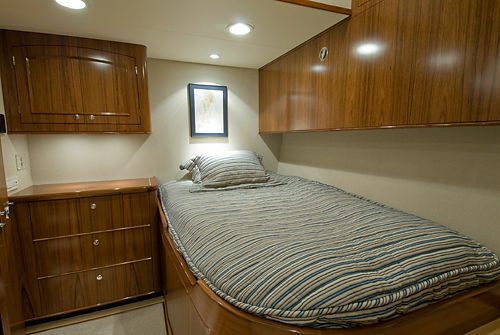 The crews stateroom has a nice sized double bed with fold down second bunk, Vacuflush head, Corian counter tops and sink. 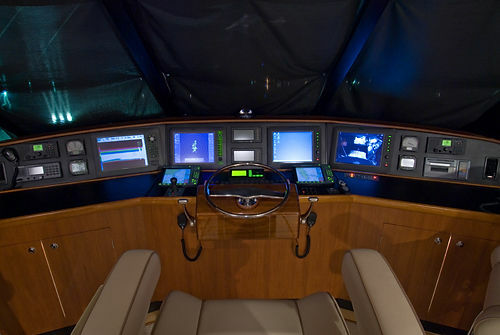 The entertainment center has 18" LCD TV, DVD, AM/FM/CD and system monitoring panel. 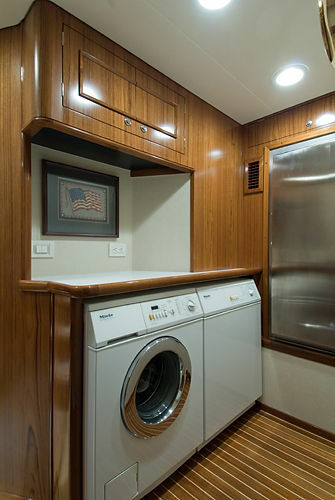 The laundry room has Meile washer and dryer with stand up freezer with 6 drawers. 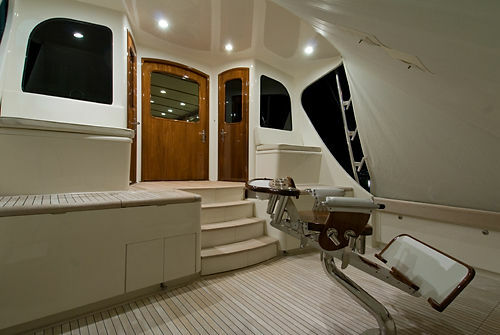 The flooring is teak and maple with Corian counter tops. From the cockpit the spiral staircase brings you into the enclosed flybride with wrap around windows, 3 Stidd captain's chairs and an L-shaped sofa with rod storage underneath. 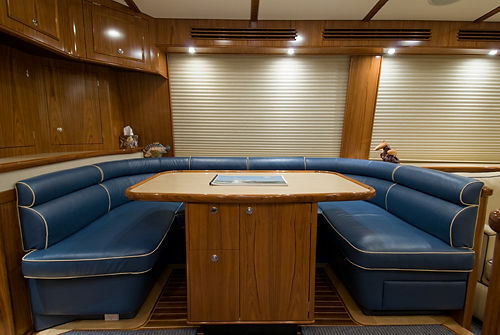 There is a chart table with drawer storage, roll-up chart compartment and sink. 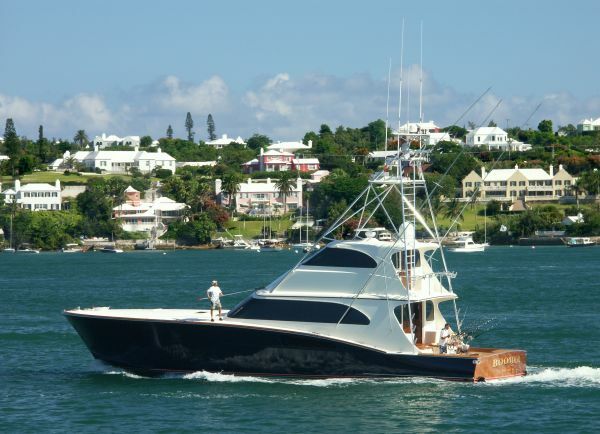 It has two sets of single lever controls with varnished pods; one forward and the other on the rear deck with electric window, this gives you the feel of fishing an open bridge boat. The electronics are set in the dash and wrap around you as you drive this beauty. 등록된지 9년이 지난 게시물입니다. 거래에 참고하시기 바랍니다. 지금 계신 곳도 한국에서는 피싱스팟으로는 최상이신데요..
그러나.. 사장님의 멈출수 없는 도전은 보다 더 이상향의 스팟을 향해 있겠지요..
새해에는 좋은 일만 거듭되시기를 빕니다!!! 지금 계신 곳도 한국에서는 피싱스팟으로는 최상이신데요.. 그러나.. 사장님의 멈출수 없는 도전은 보다 더 이상향의 스팟을 향해 있겠지요.. 지금도... 바다에서 피싱을 즐기실 수 있는 사장님이 누구보다 부럽습니다 새해에는 좋은 일만 거듭되시기를 빕니다!! !